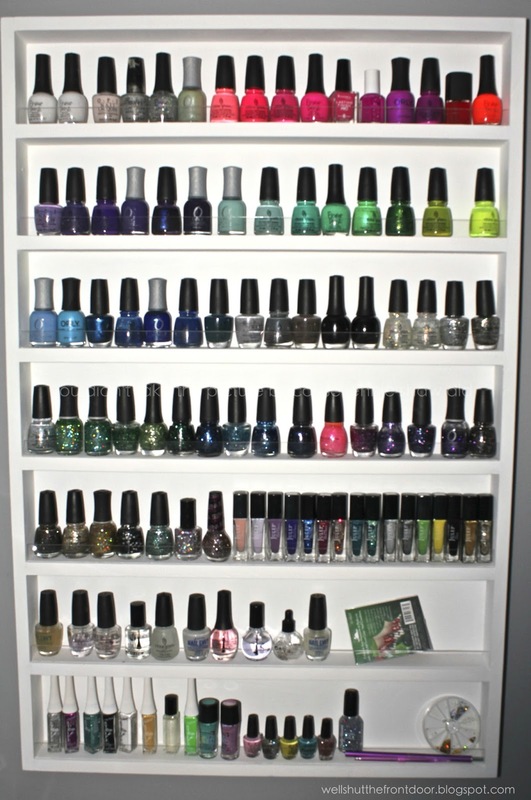 It's no secret that I love nail polish. Like, a lot. Now, it's not like I haven't always liked having pretty nails, but over the last year or so, things have gotten slightly out of control. 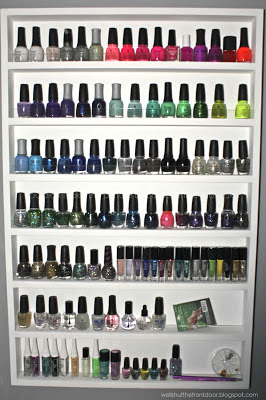 And by that, I mean that I am now drowning in have a whole lot of nail polish. At first, my collection could be contained in a clear shoe-box-sized container but soon, I needed another...and then they were so crammed that I couldn't close the tops. When I'd go to look for a specific colour, I'd sometimes have to take them all out, thusly spreading them over the top of the coffee table and leaving little room for anything else while simultaneously driving The Remix crazy because he can't live in that kind of chaos. So, The Remix went to the hardware store, picked up whatever he needed and got to work. And here's what he made me! And it holds all of my polish WITH room to add more! He's a smart one, that Remix. So now I get to sit at my vanity, do my makeup, while looking at my fabulous collection!! He really is just the best. Seriously. 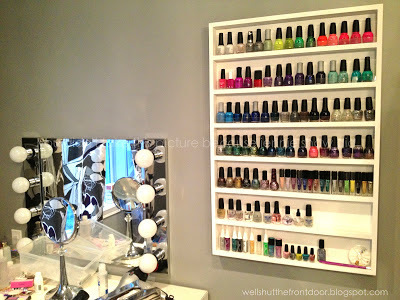 And in other nail-related news: I'm going to be taking over hosting duties for The Nail Files linkup! I know! It's AWESOME! Tara and Vicki are passing me the proverbial torch starting July 5th, so this is the last week to link up on either of their blogs and then the next week, it'll be here! Wohoo!! But don't worry about having to remember because I'll be doing all the social media stuff to remind you of the change because I know that you won't want to miss seeing what all The Nail Filers have been up to for the week. At least, I know that I won't want to miss out! Ha! Awesome! Aren't you so super stinking lucky! 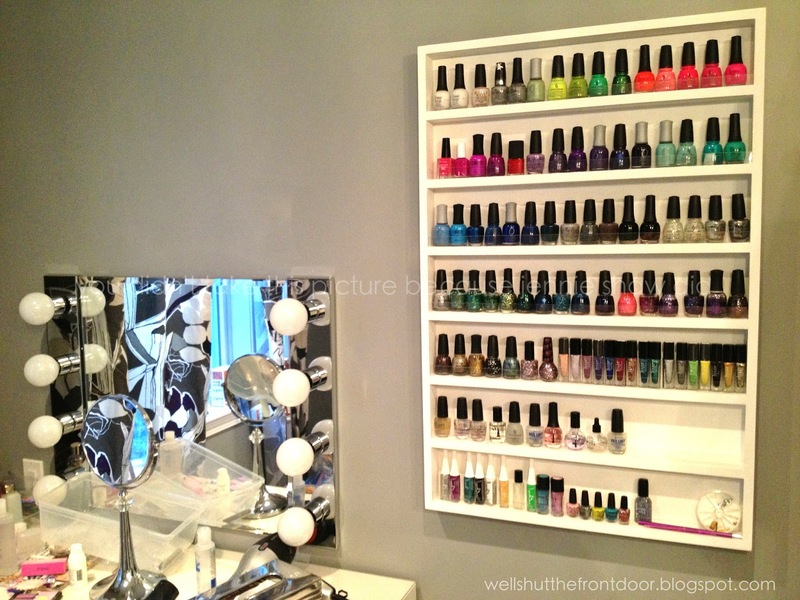 WOW I am so impressed with your nail polish display. You are so uptown! I struggle with where to keep mine. Right now most of them are in a giant martini glass that sits on my vanity & some are sitting on my vanity. But i am almost out of room. 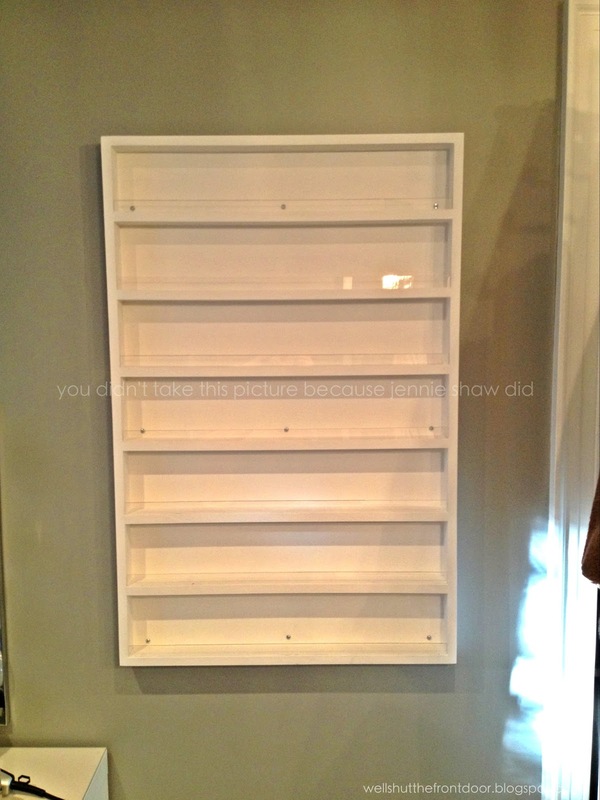 Your collection really is inspiring! Woo, congrats!! I love your mirror and lights set up. Awesome! So excited you'll be hosting the Nail Files now!